"This is how tacos tasted in Mexico... I always try to serve people a memory." 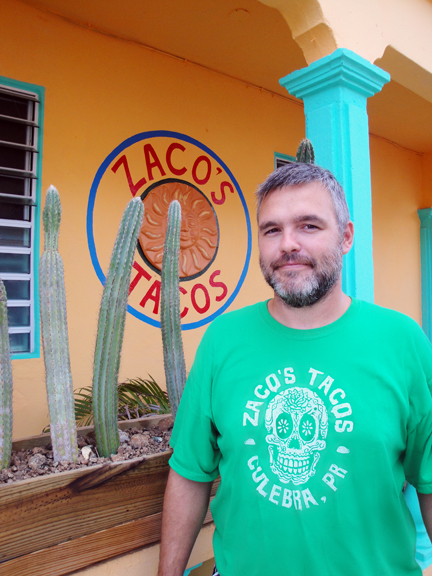 This is what Zach Sizer of Zaco’s Tacos says about his Mexican creations. For all of you who have visited Mexico, you will find that he’s correct. For those of you who haven’t, when you eat tacos after these ones, you’ll say: ‘this is how tacos taste in Culebra.’ Zach has managed to attract everyone’s attention with his Mexican cuisine. We begin with delicious carne asada nachos, with pickled onions, refried beans, cheese, homemade guacamole and sour cream sprinkled on top of each and every one of the tortilla chips so you can enjoy every ingredient in every bite. We accompany it with fresh lemonade and a variety of four hot sauces, each one with a different intensity forany taste bud. Zach’s food will stay in your head easily. Zach started his affair with the kitchen when he was a child, when his mother bought a restaurant with his grandmother and aunt. Once he went away to college, he worked on all types of restaurants (vegetarian, hippie and high class) to cover his expenses. When he graduated, he decided to to leave the restaurant business and said: "Good bye! I'm not setting foot in one again!" but it wasn't the case. Later on, he drove a rock band on tour all around the United States. During this tour, he got to know the concept of the Taco Shops. They were little shacks with a barbeque that served tacos until they ran out of ingredients. Then they closed up and did the same thing the next day. These taco shops started to shape his palate which he would later exploit in Mexico. Zach moved to Mexico to work on his thesis in Anthropology and Archeology, which granted him the opportunity to soak in the Mexican culture and, therefore, its flavors. But it wasn’t all work. He also traveled the Atlantic coast of Mexico with friends for three months. "I remember in San Blas, there was this little girl; she sold shrimp tacos and beer. So you were in your hammock and she brought this for $5. It was perfect, beach and tacos... we stayed fora week." Memories like this one made Zach experiment with his menu and realize that Culebra and tacos could go hand in hand. He offers variety: seared tuna tacos, shrimp tacos, eggplant tacos and, our favorite, pork belly tacos. They’re served in corn tortillas and sautéed with pickled onions, cilantro, oil and Mexican cheese. Curious as to how he found out about Culebra, we asked him how he got here. He says he saw an ad for a job opening as a bartender at Dinghy Dock. He quit his job and ventured out to see what fate would bring. Afterward, he worked as a cook at Mamacita’s restaurant where he experimented with flavors and would sometimes sneak in a special with the Mexican flair he so enjoyed preparing. Already with a family in Culebra, Zach is pleased with how his life turned out. "The awesome thing about taco places in Mexico is that you can go to a taco stand in Mexico City and sit side by side to the mayor. All are at the same level. Everyone can enjoy good food. In my mind, I always wanted a place like that." 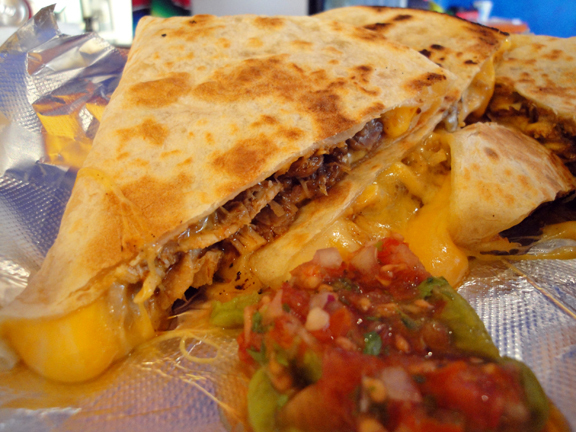 The thing is, the variety of the menu and the friendly feeling you get at Zaco’s Tacos inspire you to do just that. Sit down, order everything and share it with friends. ¡Buen provecho!